Dear Dell: Quit calling me! No, I do not want to purchase any additional programs, insurance, payment protection, fraud protection or plant a tree. No, I do not want to take a survey regarding the level of service, whether or not I liked my computer or thought it was a good deal, or my overall satisfaction (this may change depending on the number of times you continue to call me!). Yes, I am very happy with my computer. No, I am not experiencing any technical issues. If I do, I will give YOU a call and explain to you the problem and I am sure you will fix it since I bought the warranty. Which brings me to another point: No, I do not want the extended warranty and I do not want a “buy back” warranty. I do have a brain and if I am ever of need of any of the above services, I will call YOU. 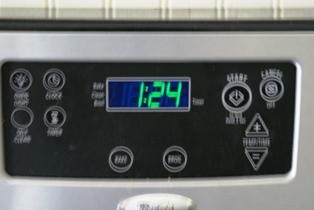 If you continue to call me and harrass me while I am trying to cook dinner, or doing my homework, I will think very hard next time before purchasing another computer from you. If I would have known that this laptop would come with an average of 2 calls per day from your sales department, I probably would have just ran down to Office Depot and purchased a computer there. Please do not insult my intelligence by couching your attempts to upsale me something into concern over the performance or my overall satisfaction of this machine. Puh-lease! I would assume that the average person purchasing a computer could figure out how to call your 800 number and avail themselves of your warranty services. Your thinly veiled attempts at selling me something is seriously wearing on my nerves. All right, so I admit it, I am a nosy old broad. Unfortunately, the way my mind works, I cannot get something out of my head until I reconcile it one of two ways. 1: That it makes sense, factual sense; 2. The mystery gets solved. 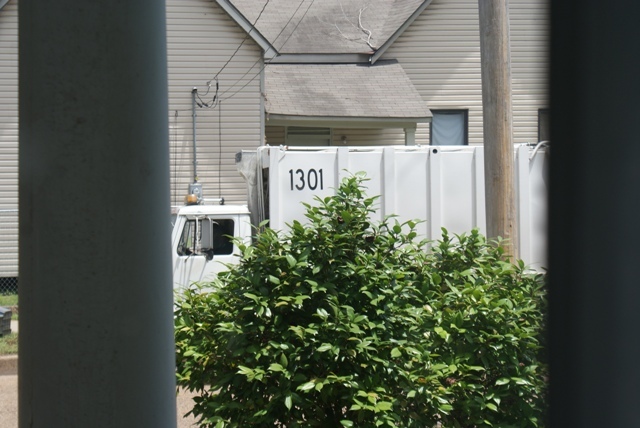 So, what is truck 1301 doing in front of my neighbor’s house at 1:24 p.m. on a Thursday afternoon? 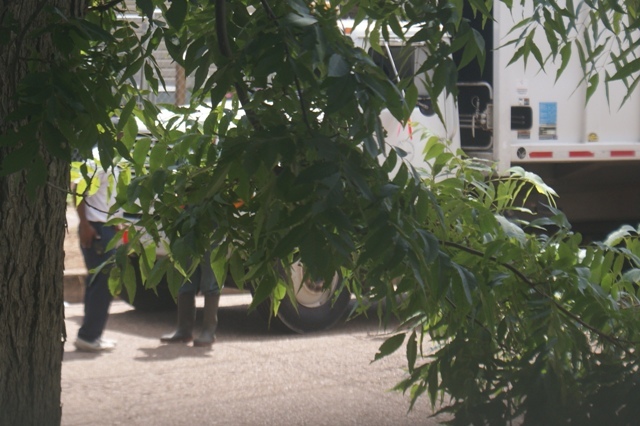 The driver (not my neighbor), retrieved a blue ice chest from the porch, stuck it in the back of the truck, then got back in the truck and drove away. 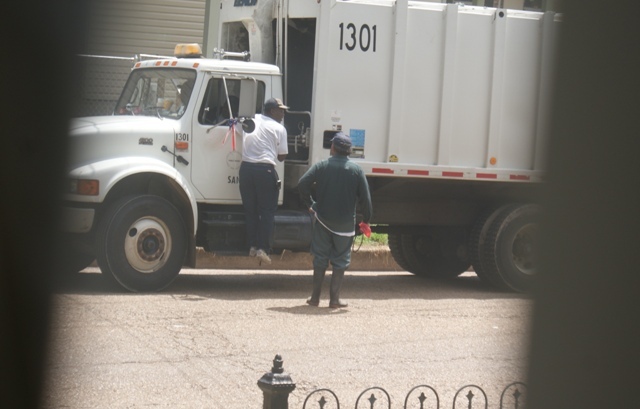 Is my neighbor ministering to the trash men by providing respite and water? Is he perhaps peddling drugs? Are they friends? Is this the end of their route? If so, then why do they arrive here at different times during the day? 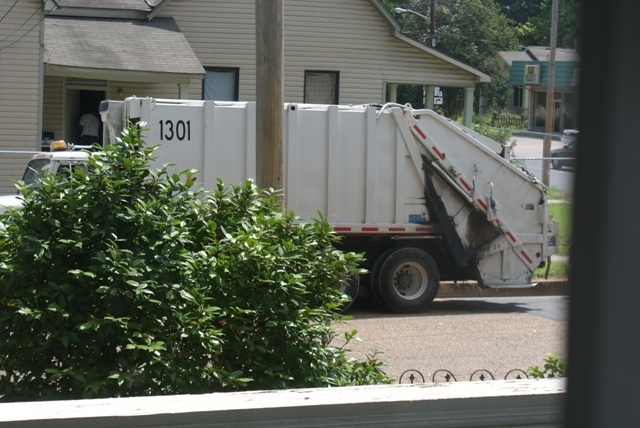 A different truck picks up our regular refuse on Monday and Thursday and it is early in the morning. 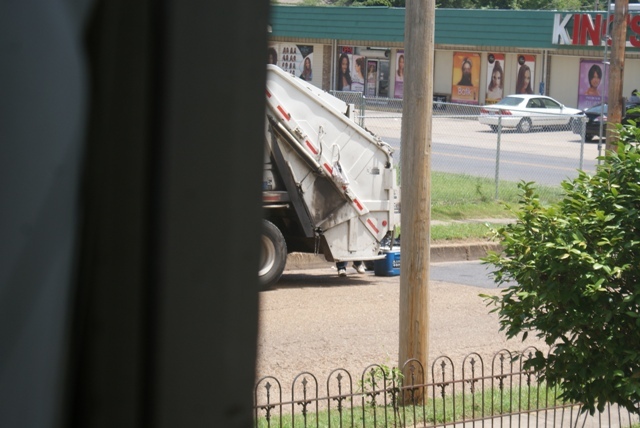 I note that our trash was picked up early on Thursday, so this truck was not there to pick up our trash. Yes, I am too nosy for my own good. Maybe when summer is over and Vivi and I both go back to school, I will be more consumed with my studies rather than the strange goings on of the trash men of Alexandria… 🙂 Until then, I will just obsess about it. Since I have not renovated much in a while, I need to change my name from perpetualrenovator to obsessed-trash-man-watcher! Ok, enough of this absurdity! Its getting late. Gotta go to bed! 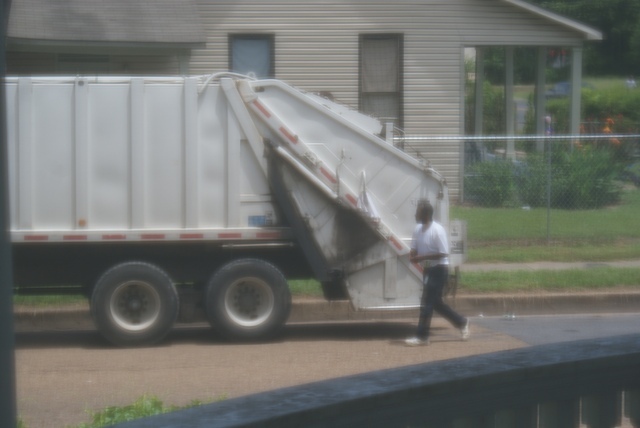 Upon closer perusal, I note that the truck parked in front of my neighbor’s house periodically is not a regular trash truck. 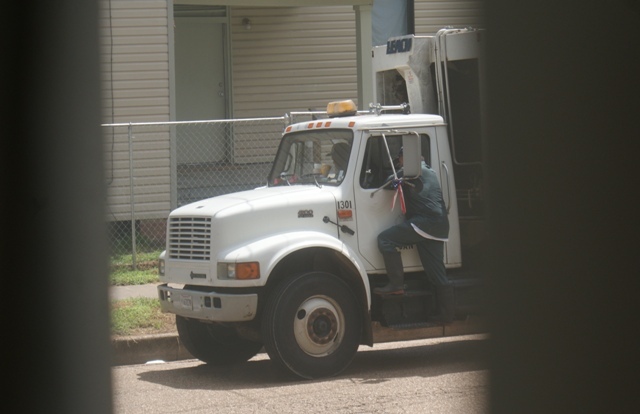 It appears to be a special trash truck, maybe for special pick ups. Not sure. 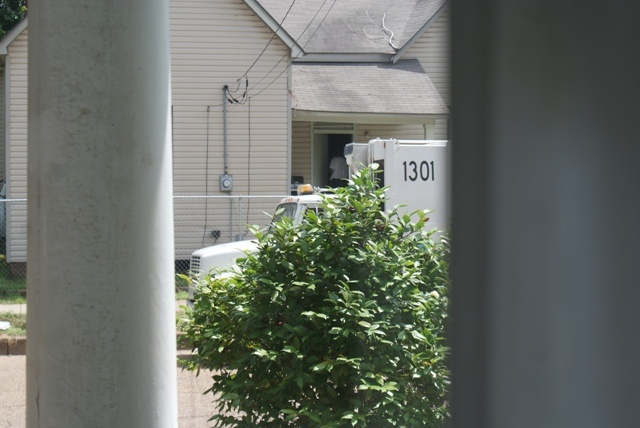 Anyway, they were parked in front of my neighbor’s house today, talking to him. My neighbor went in and out the house several times and then finally brought the driver a tennis racket. I noticed them at 11:35, not sure how long they had been there already, and they pulled out at 11:55 a.m. To his credit, the man sitting in the passenger seat was eating. Apparently it was HIS lunch break. Not sure about the driver (he stood outside the truck the whole time he was here, not eating, so can’t say he was on his lunch break), or why they were in front of my neighbor’s house again. In all fairness, it may be their lunch break and this is where they land. I sure would like to know, especially after tree limbs and yard waste sitting in front of my house going on five weeks now.